I love Christmas, I do. I am a glittery tinsel bandit and a complete festive junkie, and I love nothing more than the optimism, jolliness, and general sense of magic that accompanies this time of year. Galloping around the house terrorising my family with my awful rendition of 'all I want for Christmas'? Check. Eating my weight in turkey and cranberry sandwiches? Check. Dawdling under the mistletoe like a yuletide desperado? Check. Yup, the majority of my December is spent fully invested in festive cheer, trying not to urinate with excitement. There is, however, one particular aspect of Christmas that never quite lives up to my annual hype. Christmas shopping. Christmas shopping is irritating. I know I'm not alone when I say that every single year without fail, after a particularly unenjoyable Christmas shopping trip, I promise myself that I will 'definitely have it ALL done by September next year' and I will 'absolutely do ALL of it online'. I envisage that I will spend December cosied up in my own jubilant smugness, worrying only about how many mince pies I have left and whether or not there will be any improvements to my wrapping technique this year. 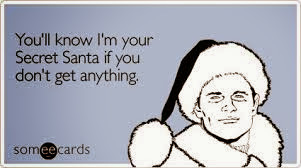 (Aka whether or not the presents I dish out will still look like they were wrapped by an intoxicated goat). And then... Oh. September comes, September goes, and mid-December creeps upon me like a naughty little elf and scampers away with all that time I thought I had, leaving me with only 10 measly days to find appropriate gifts for the entire world and his wife. Christmas does peculiar things to people. Despite our online promise (I know you made one too), we just can't help ourselves can we? We want to get into the 'spirit' of things and mingle with our fellow yuletide revellers. We decide to brave the shopping centre. Now, there are many things that shout 'it's Christ-maaaaaaaas!' at me. Some of them, such as Slade, reindeer onesies, and the tacky pop up Christmas shop that rocks up in town each year, fill me with a sense of joy that warms me to the depths of my grubby soul. Others are entirely less satisfying. Perhaps the most unsatisfying of them all is the shopping centre thermostat. Come Christmas, those places are so hot that I'm adorning a sweaty brow before I've even gotten both boot-clad feet into the first store. Am I here to buy Christmas presents? Or am I here to be marinated and served up with chips?! What is my life purpose? Somebody, help? Please? I don't know if it's the heat, or the time limit, or the expectation, but put me in the middle of a bustling crowd on the hunt for that 'sparkly, snazzywazzy, gooooooooorgeous' dress that mum wants, or those adorable, discounted penguin snowglobes that Margaret from the office keeps waffling on about, and I've practically had a personality transplant. Does anyone else suffer from the same problem? Do you parade into town feeling like lovely you, only to realise that after just ten minutes in that first shop, you are delirious and entirely confused about everything? Is that dress blue enough? I mean, it's not quite a blue, blue, it's more a bluey, blueish-blue-blue blue, comprende? No? Me neither. Oh gosh; Christmas is ruined. I try not to let it phase me straight away. Every year, after that first store, I think to myself, 'just a minor hiccup! The rest of this trip will be just LOOOVEly! ', and every year I am greeted with the same Christmas-coated disappointment. Whilst I imagine myself gleefully strolling in my novelty jumper, exchanging kind merriments with my fellow shoppers, I end up charging around like a ravenous beast, being told to 'f*ck off' for blocking up an aisle whilst I take a moment to stroke the gingerbread man stand. Whilst I picture myself taking a well-deserved break a little later in the day to enjoy a relaxing hot chocolate and a chinwag with a fine chum of mine, and perhaps even a frolic with my chocolatey moustache (not a euphemism, I promise), the reality is that I can't get a seat. And even if I can, I end up complaining about my sweaty brow and fretting over whether that dress is too much of a bluey, blueish, not-quite-blue enough but bluey-blue blue...Do you know what I mean? No? Me neither. Oh gosh; Christmas is ruined. And so, as the busiest Christmas shopping weekend of the year approaches, I ask of you three things. If you're in charge of the shopping centre thermostat, are you bonkers?! Turn it down! Shall we do it all online next year? Harhar, bloody love it. I usually love shopping in town, but this year I was like NONO and did most of it online. I did go in a few days ago, but just faffed in Primark and TK Maxx for ages, considering buying utter tat that people clearly would not like. Ebay is the way forward!